The Aiptek PocketCinema V10 (MSRP $299.99) is a nicely packaged and well thought out pico projector. It's the Swiss Army Knife of picos and comes with every input you would need to watch a video or make an instant slideshow presentation. At 5.6 ounces including battery, it is both small and light. Load a movie into your iPhone and you can watch it on a big screen at home or in line at the grocery. And your screen? Well that could be the wall, floor, or on the back of the guy standing in front of you. When you bring the Aiptek PocketCinema V10 to a meeting, you can leave your laptop behind. The PocketCinema V10 has a built-in 1 gig of memory and SD-card reader so you can show your presentation on the fly. If you are starting to think that I like this projector - you're right. Aiptek definitely did their homework. This is pico projection the way it was meant to be. The Aiptek PocketCinema V10 is a native 640 x 480 resolution (VGA) projector and uses 3M's LCoS Microdisplay technology that will deliver a 45" diagonal image with a 5' throw distance. The Aiptek PocketCinema V10 has a composite video input, 3-in-1 SD-card reader and USB connection for transferring files to and from your computer to the V10's internal 1 gig of memory. The V10 also has a built-in speaker and a dial to focus the image. Through its composite video input, the Aiptek PocketCinema V10 connected easily to my iPhone, DVD player, and my Nikon digital camera. The V10 can also display information from a camcorder, gaming device (Wii etc.) and portable media players; basically anything that has a composite video output. Video - You have many options for showing video through the Aiptek PocketCinema V10 and this is how you'll probably use it most. Its native aspect ratio is 4:3 and it will display a widescreen video in letterbox. It's not a home theater solution but in a darkened room and with an audience of 10 people, I think you'll like the results. If you are looking for a pico projector focused on video only, check out the Aiptek PocketCinema T10. It's the widescreen cousin of the V10 and does not have the 3-in-1 SD card reader or 1 gig of memory. mpeg3 audio files on its 1 gig internal memory. I'm sure most people will just trash the sample files (except the Savage Garden mp3s) and start transferring their own files to the PocketCinema V10. The SD-card reader and the internal memory basically replace the role of a computer in your presentation. The transition between slides is random and you are not able to edit the order of your slideshow. You are now presenting without a computer and allowing others to present via their own SD-card. Portability - It's hard to get more portable than the Aiptek PocketCinema V10. It weighs in at 5.6 oz including battery and has a small footprint to match. You may find yourself digging in your pockets to find this projector. In my tests running a continuous video clip off of the internal memory, I was able to get 75 minutes of battery life. 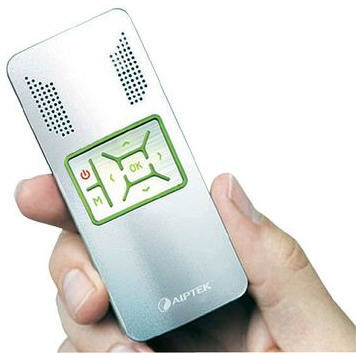 Speaker - The built-in speaker on the Aiptek PocketCinema V10 is useful for small groups. You can add background audio to your presentation or play the audio from the video you are displaying. The speaker is definitely necessary when you are connecting the PocketCinema V10 to a non-portable DVD player or mobile phone because it may be the only way to get the audio without additional hardware. Note: The AV connection on the V10 also serves as an audio out or headphone jack. With headphones I had quite a bit of noise and a big pop when I powered the projector on. Accessories - The Aiptek PocketCinema V10 includes a USB cable, power adapter, a soft case, a remote control, and a CD-ROM with ArcSoft's Media Converter software and documentation that allows you to convert your MPEG-4 and AVI files into a format that is compatible with the V10. It also includes a mini-tripod, which is an essential accessory for hands free operation of your pico projector. Without it you would likely need a stack of books to put the image where you want it. Brightness - I remember telling people in an earlier work experience that lumens were like RAM memory on a computer - you can never have enough. I think I have to qualify that statement a little when discussing the Aiptek PocketCinema V10 and add "...unless you are presenting with a projector that weighs around 5 ounces". If you can manage the lighting in the room and the image size, you should do fine with the V10. Just understand that this is intended for a very small audience and image quality will not be as robust as a traditional projector. Color Saturation - While testing the Aiptek PocketCinema V10 with video and photos, I found that the colors appeared washed out. It looked as if a light gray film was placed over the screen. A possible solution is to increase the color saturation of your pictures so they'll appear more vibrant on the V10 and with video, you could try to increase the color level of the source (DVD player). File Sizes - You may need to reduce your image sizes when you want to use the slideshow feature of the Aiptek PocketCinema V10. In my tests I had difficulty displaying some of my 5 MB photos from the internal memory and my SD-card using the built-in media player software. However, I didn't have a problem connecting a digital camera or using the SD-card from a digital camera. I suggest you preview any media you plan on showing with the Aiptek PocketCinema V10. As a portable presentation tool and cinema projector, the Aiptek PocketCinema V10 has all of the right inputs and comes with the accessories needed to take your presentation on the road or watch a movie. I really liked Aiptek PocketCinema V10, but you need to recognize that pico projectors lack the resolution, brightness and contrast of the bigger projectors. It is a VGA projector and image quality for any pico projector is best in minimal ambient light using a white surface for displaying the image. In the right conditions you'll be pleasantly surprised by the features and fun of the Aiptek PocketCinema V10. Aiptek is not a household name yet and while this could put the V10 at a disadvantage in the marketplace, their pico projector is impressive and deserves a look. nice model........ but my only doubt is .....since the backup is only 75 mts. can it be connected to any power source while using to get get extra backup time? Can you teach me how to put movies to v10?Because everytime i convert into arcsoft i always fail.i want to learn how to convert an avi file and play it to my v10...thank you!!! i have this product and i am going to send it back today. i have wasted half a day trying many, many different formats to convert existing movies inot, so they play on the thing. not only did none of them work, but the software is so crude that it doesn't tell you that it will not or cannot play a file it just trieds and hangs, so you have to remove the battery each time and crash it, just to get access again. nice idea, nice market space, will definitely become more popular, but this one isn't much good! 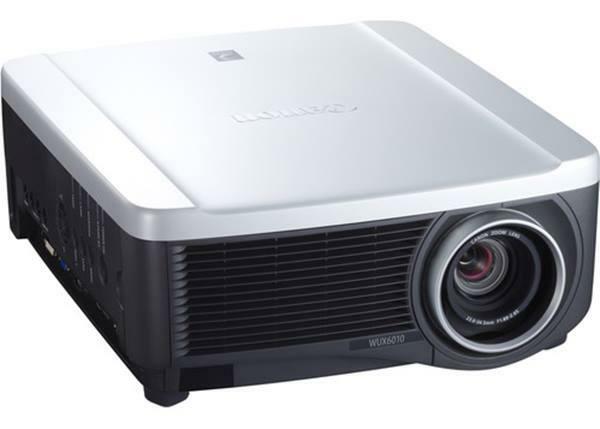 This projector is good but please let me know how to convert word,powerpoint and video file to use with the v 10 projector. Can it be connected to TV? Just got v10 no video in working who services these in Australia OR any new fix Also does teh new firmware update Ver A so that through USB will play computer on projection ? Can Iuse the T15 with my iphone4? The projector is not getting ON after it got switched off automatically after the battery back up got lost. Don't buy this, I have a macbok pro and nothing I do is seems to work. The format is seems to be the BIG PROBLEM on this product when trying to use the memory card it doesn't want to play. I've spent hours converting to every possible mpeg, mp4, avi. and It just doesn't want to read any of it. Can any one tell me how to put movies to v10?Because everytime i convert into arcsoft i always fail.i want to learn how to convert an avi file and play it to my v10...thank you!!! It comes in a compressed RAR format but once i was able to install the program and from the initial setting without changing anything I converted a TV show and copied it on the projector and worked first time. Good luck! ps: project movie over your head on the ceiling with earphones, from your bed! terrific!